The use of fractional executives (also referred to as interim, part-time, on-demand, or outsourced executives) has traditionally been related to business functions such as finance, human resources, or technology. The use of the word “traditionally” deserves to be put into perspective. The oldest and largest fractional executive company, B2B CFOs, was founded in 1987. While fractional Marketing and Sales executives are a “newer” concept than using fractional execs for back-office functions, fractional Marketing and Sales execs can provide critical expertise and timely support for SMBs with growth challenges or those interested in more rapidly accelerating growth! We are going to use the terminology “go-to-market executives” to refer to both fractional Marketing and Sales execs. These roles are not the same but are compatible and collaborative when helping set and execute a business’ growth agenda. Every business believes that it has unique needs; and, if one believed otherwise, markets would simply be look-alike businesses that lack unique value propositions. SMBs are also different than their larger competitors but are often forced to compete under the same regulatory regimes, industry certifications, and market conditions—but without the deeper expertise or financial wherewithal of their larger competitors. To compete and win, SMBs must meet, and in some cases exceed, the same requirements as larger companies, but with fewer resources, less access to talent with team members that may lack the experience that exists at larger organizations with battle tested marketing and sales executives. Often, executives in larger organizations have more experience in navigating growth challenges and breaking through to achieve scale. Think about the relationship of SMBs to their Fortune-500 competitors this way: they have the same scope but vastly different scale and resources. Because of scale issues, small- and mid-sized businesses often compete in a world of “expertise inequality.” They often do not have the same level of strategic planning skillsets, industry knowledge of best practices, or experience developing their employees to even the playing field with larger competitors. Technology, like the Internet, has helped level the playing field for small business. For example, small community banks can offer the same mobile banking services as the largest players today. As long as capital is available, SMBs also have access to the same production technology, customer relationship systems, and marketing automation systems as larger companies. Experienced fractional marketing and sales executives usually have experiences working in both small and large organizations solving complex problems. The SMB can learn from both the successes and mistakes of other organizations. Fractional executives, especially fractional “go-to-market” marketing and sales executives, offer SMBs a timely, cost-effective option to tap into the expertise of senior executives who join their business for a defined period, assist in identifying key insights, design a growth strategy and implement an accompanying sustainable growth engine. When the strategic work is done, fractional “go-to-market” execs will often enhance execution of that strategic work by developing processes, platforms and the business’ staff so it can move ahead in a more competitive manner than before the fractional exec was engaged. Think about the fractional exec as providing a boost, or turbo-charge, to more quickly create or enhance the strategy and infrastructure for sustainable and improved performance. When fractional leaders are no longer needed, the business typically has achieved an accelerated rate of growth, improved its competitive position, reengineered key business processes, and organized and staffed its Marketing and Sales functions for future success. Your typical consultant may help develop strategies or plans, but are not usually associated with the implementation of the plan they helped develop. That is part of the challenge you face. You may call the services which fractional Marketing and Sales execs deliver “consulting,” but most are former hands-on practitioners and are better characterized as additions to your leadership team for some period of time than as consultants. 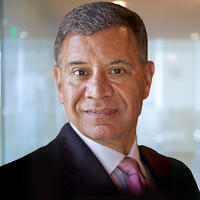 The advantages of fractional “go-to-market” executives are numerous. They are usually familiar with your industry, so learning curves are reduced and you don’t spend your money on teaching them your business. Effective fractional executives are adept at assessment, pattern recognition, solution design, and implementation. They bring best practices from a variety of organizations they served in—often from larger companies in your market space. They bring in best practices from a variety of clients. Sometimes the most creative ideas come from someone who has tried things you have not. The CEO/Owner of a large number of SMBs also wears the sales leadership hat. Outsourcing this responsibility to an experienced fractional sales leader allows the owner to focus on leading the business in a visionary or integrator role. Let’s look at two case studies to see how this works practically. Dalsin is a $40-50MM family-owned metal fabricator located in Bloomington, MN. As the business has grown, it had to address several issues to continue its historic rate of growth, which has been 2x industry averages. First, it had to overcome a customer concentration issue when one large customer became too dominant. Second, it had to improve its marketing programs as they were based solely on Internet generated leads. This wasn’t a problem in itself; but, filtering its real prospects from thousands of monthly web visitors was using up sales time and caused the sales staff to spend too much time on non-ideal buyers and on quoting unprofitable business. Third, as the business continued to scale up, it needed to improve its branding and competitive positioning. Finally, the business discovered an opportunity to introduce a global fabrication supply-chain program and needed a formal business plan to guide the launch and growth of this incremental business opportunity. Dalsin has used a fractional Marketing executive one-day a week for the past five years. The executive supports the CEO and executive team with three-year and annual business planning. The fractional Marketing exec drives more strategic, integrated, and proactive marketing programming than the company could before (think of going from a “small M” marketing program to a “large M” program). 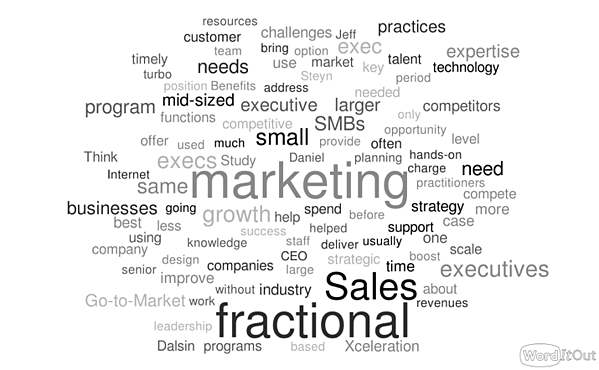 What results has Dalsin Industries achieved through its use of a fractional Marketing exec? It gets senior-level talent with the ability to help with business strategy, marketing strategy, and marketing program execution for the same cost as a mid-priced and less experienced marketing manager. It operates its marketing program with no marketing staff and all contract resources for content development, digital and website management, and its account-based marketing program. This allows marketing expenditures to be variable, based on the business needs and conditions. It spends only 1% of revenue on marketing (versus 3.2% for a typical manufacturer). This approach to marketing leadership has helped the business grow its revenues 25% in 2018 over 2017. An expert from Sales Xceleration was brought in to support these immediate needs. Through their business knowledge and sales process expertise, and use of best practices, the fractional Sales exec was able to create a customer-facing sales process and build a sustainable sales behavioral model. To help drive productivity they purchased, customized, and trained the team on a suitable CRM. By defining accountable sales metrics, pipeline development improved. A uniform sales process improved forecasting accuracy. Finally, the fractional Sales resource implemented a compensation plan focused on new revenue generation. The results the services business derived from the engagement of a fractional Sales exec are dramatic and immediate. Initial client meetings per month improved by 360% in the first 90 days. The business closed over 500% more revenue in 90 days than the previous 7 months combined. There are numerous success stories of businesses engaging fractional Sales execs, and you can find them on the Sales Xceleration website. 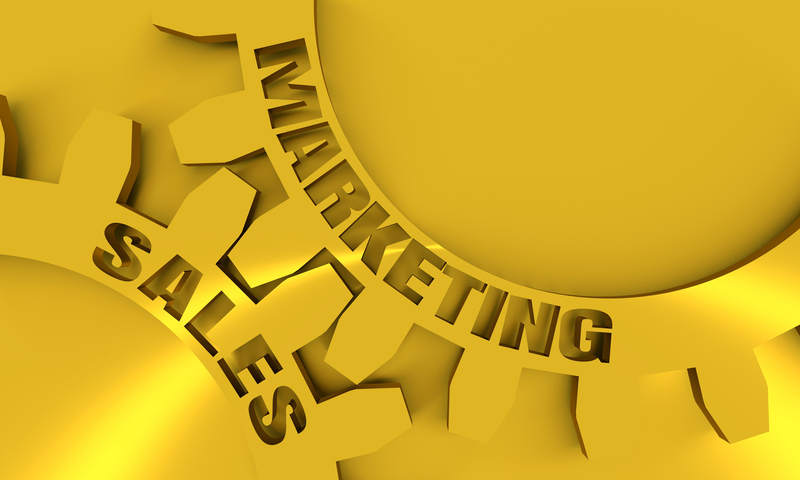 Why Marketing AND Sales, and not just one? You might need one resource or the other (or both) depending on the challenges you are facing. The simplest and fastest way to determine what type of fractional executive support might provide you with the highest benefit is to give one of us a call to discuss your needs. Mark Coronna earned note as one of the first ecommerce industry executives, and built a career leading marketing efforts for some of the most revered names in software and financial services, including Deluxe Corporation, Wolters Kluwer Financial and US Bank. Coronna is a globally experienced executive with consistent growth, turnaround and repositioning results across multiple industries and business sizes. He is known for accelerating business growth through deep knowledge of marketing, business development, and technology management.